After some delay I’ve finally gotten my hands on the Asus VG236HE (the version without bundled 3D Vision glasses) which is the same in terms of hardware and performance as the Asus VG236H which comes with the shutter glasses bundled. 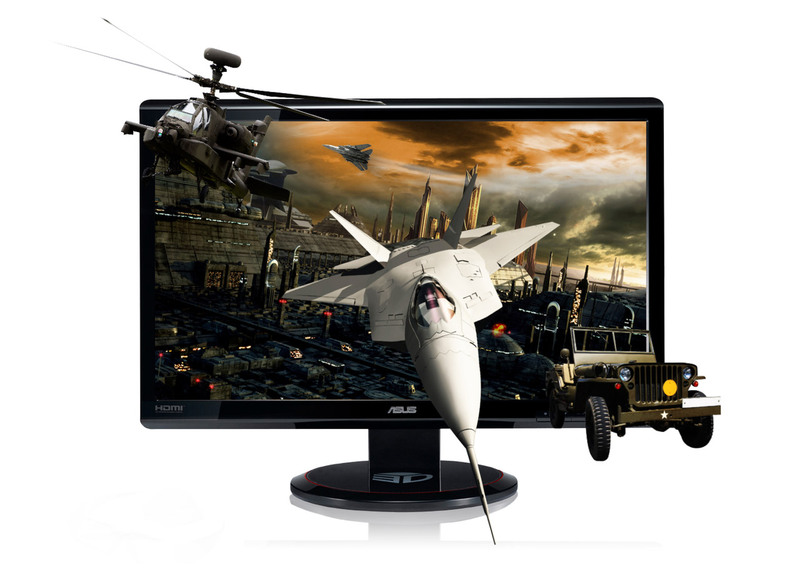 As you probably know the Asus VG236HE is one of the latest 120Hz 3D-capable LCD monitors compatible with Nvidia’s 3D Vision technology, but what sets it apart from all other such products is the fact that this is the first 3D-capable 120Hz LCD monitor with a glossy screen, as all others so far were with matted screens (apart from the 120Hz LCD panels used in 3D-capable laptops that are also glossy). Now this kind of reflective coating over the screen can create some reflections when darker image is being displayed and some people do not like that much, although more and more monitors in general are being made like that, but you can get used to that or just avoid it by choosing another product. But I’ll leave that for when I’m ready with the whole review of the monitor, and for now let me just show you how the monitor performs in terms of input lag. As you can see from this photo, there were moments when the LG and Asus were performing the same, meaning that there was no input lag at the specific moment, unfortunately the situation was not like that all the time. The minimum input lag measured on the Asus was indeed 0 milliseconds, meaning no delay at all from the moment of receiving the image and displaying it on the screen, however the average and maximum delay was more than zero. The maximum input lag I was able to measure was 17 milliseconds which is not that bad, but for a high-end gaming monitor with 120Hz refresh rate and intended for playing games in stereo 3D mode one would expect to have no input lag at all, right? Bloody, what does it mean input lag, what are the implications for that?? I have the Alienware OPTx A3210, and reading your review you said it doesn’t have input lag, is this a bad or good thing? I thought input lag was something related to response time, not sure If I got this right? I know my Alienware 120hz display has a 2ms response time. Input lag is the time needed for the display to visualize the video data it receives from the video card, if there is no input lag there is no delay processing the image and you see it immediately on the screen. If however the electronics processing the image data needs some time before it is being shown on the screen, this means there is some input lag and the time it takes for the image to be shown on screen after being sent to the display is the input lag for that given monitor. So what does input lag do? It slows down your reaction time by a specific amount making you not so competitive in fast paced action games. When you see something on the screen, like lets say an enemy you need to shoot down in an FPS game you need some time to react and move the crosshair (the mouse) in order to get it over the enemy character and click the mouse button to shoot him down. This time depends on the person playing however lets say you need an average of 200 milliseconds to react to a visual stimulus on the screen, so if your monitor has an input lag of lets say 20 milliseconds your reaction time will be 10% slower. That will be a disadvantage for you that is not related you your own abilities, but implied by the hardware you use. Additional delays may be introduced by the keyboard/mouse responsiveness, the ping you have to a network server if you play online etc. For competitive online gaming or for pro-gaming usually everyone is looking to minimize the negatives of the hardware, so that his own abilities will be the key factor for success, so input lag is just one thing you don’t need to have. Thank you for the detailed explanation!!!! Can you display this picture in 3D, to show the ghosting, please? Love you. If you can do it for all 3D Hardware you get, it will be so great. Don’t hesitate to sending it by eMail if you like. Sorry for my frenchy english. Bloddy, I currently own the samsung 2233rz, but i’ve been wanting to change to the 1920*108p resolution. And this Asus really cought my eye. Since the monitor was release a year ago, do you think that Asus, maybe have been building these monitors with better components since release, making said average 8ms come closer to the 2ms reported by Asus? Also could the response time be improved with better PC hardware or it’s completly all up to the monitor? Would you recommend a better monitor or wait for newer ones? How does trace free affect input lag? Please respond, should I put it at 100 will that reduce input lag or make more?